Even though it was the first day of their Spring Break, this past Saturday 598 kids, 275 volunteers, 115 parents, and 25 teachers & staff helped to make our April 13th reading clubs a success! 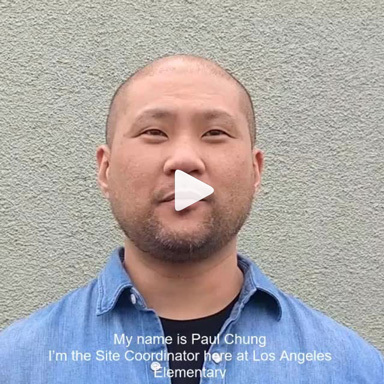 Click the above image for a wonderful Instagram video of Site Coordinator Paul Chung discussing and showing what we do! Sign up early for our May 11th reading clubs! RSVP for these magical Fantasy, Folklore, & Fairytales reading clubs here. Please also take a moment to join our May 11th Facebook event and invite your friends to join, too. Are you crafty? On Sun. April 28, join the Curriculum Committee at Noon in the Reading to Kids offices to help create the activity and craft guides for the May books! Our address is 1600 Sawtelle Blvd, Suite 210, Los Angeles, CA 90025. Click here for our Facebook event, or click here for the Evite - or simply show up! READING TO KIDS IS HIRING! Are you ready to work full-time at a nonprofit where you can make a big difference? Reading to Kids is hiring a Program Coordinator for a permanent position! The position is posted on our website, where you can read it by clicking on the Program Coordinator button below Latest News. Be sure to apply as soon as possible. Please share the above position with anyone you think would be a good fit, especially if they have volunteered with us before! We'll also have a silent auction, a DJ, and a video presentation, with comedians Jodi Miller, Henry Phillips, Darren Capozzi, and Adam Richmond performing an incredible night of comedy! Please also click the above image for our 20th Anniversary postcard to share online or forward to anyone you know who may be interested in going. If you can volunteer at our 20th Anniversary Celebration on May 11th for two or more hours from as early as 4pm until the end, please call the Reading to Kids office at (310) 479-7455 or email info@readingtokids.org. We need your help finding sponsors for our 20th Anniversary Celebration! Here is an explanation of our sponsorship opportunities for you to share with your employer. Thanks, and we hope you can join us at our May 11th reading clubs and party with us at our 20th Anniversary Celebration that night!